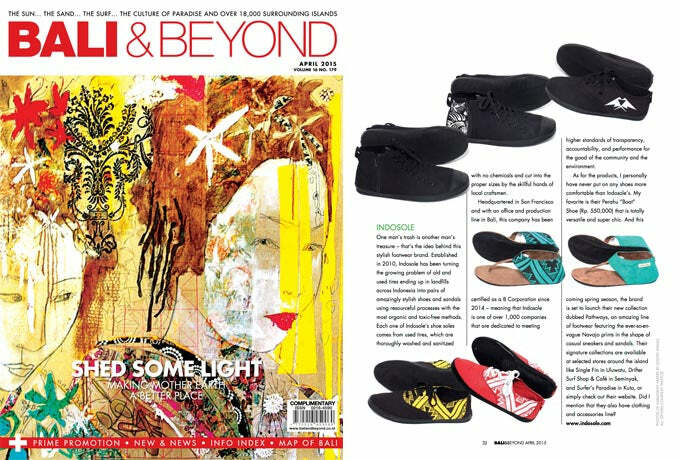 This month we were featured in the newest issue of Bali & Beyond magazine (April 2015), in a great article titled ‘Cool as Green’ profiling eco-conscious brands such as Utama Spice, Saraswati Papers, Biowear, and the Bali Recycling Company. Author Ariko Ahmad points out, “I personally have never put on any shoes more comfortable than Indosole’s. My favorite is their Prahu “Boat” Shoe that is totally versatile and super chic,” a statement we completely agree with. If you want to experience what Ariko is talking about, go here for Men, or here for women, and get yourself a pair! We are as always extremely grateful for the coverage in Bali & Beyond Magazine, and to be featured alongside some awesome companies that work hard to do good. Read the full article here.